Safecoat Eggshell Zero VOC is a premium quality, fast curing paint designed for interior surfaces where a medium sheen finish and superior film formation properties are needed. Safecoat formulas are uniquely designed for optimal indoor air quality and minimal exposure to chemical toxicity. They are ideally suited for areas in which the health of occupants is of particular concern, including schools, hospitals, homes and offices. Safecoat contains no formaldehyde, ammonia, aromatic hydrocarbon compounds, crystalline silica, or ethylene glycol, exempt solvents or hazardous air pollutants. Safecoat paints have almost no odor during application and are odor free once cured. Provides a soft sheen for areas not generally exposed to high traffic. Tintable to thousands of colors with zero VOC colorants. New or existing, properly primed interior walls and ceilings, properly cured and pried plaster (below 10 pH), masonry, woodwork and primed metal. Superior, durable finish. Fully tintable in bases with zero VOC colorants available at most Safecoat dealers. Low odor, safely used by and for the chemically sensitive. Fights indoor air pollution, limits off gassing. Zero VOC content, meets or exceeds all federal and state air quality regulations, including California. 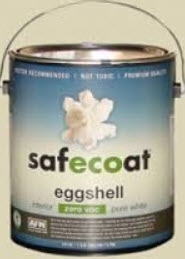 One gallon of Safecoat Zero VOC Eggshell covers approximately 350 square feet in one coat depending on surface porosity. Untreated drywall will require several coats. Eggshell sheen adds more durability. Tintable to thousands of colors with zero VOC colorants. Please note: few computer monitors render color precisely, and accordingly the image you see may vary dramatically from the original color chip and painted surface. ** If you choose Accent or Deep Base colors there is a $1.25 surcharge for quarts and a $5.00 surcharge for gallons.